The caterpillar fungus Ophiocordyceps sinensis (previously called Cordyceps sinensis) has been used for centuries in Asia as a tonic to improve health and longevity. Recent studies show that O. sinensis produces a wide range of biological effects on cells, laboratory animals and humans, including anti-fatigue, anti-infection, anti-inflammatory, antioxidant, and anti-tumor activities. In view of the rarity of O. sinensis fruiting bodies in nature, cultivation of its anamorph mycelium represents a useful alternative for large-scale production. 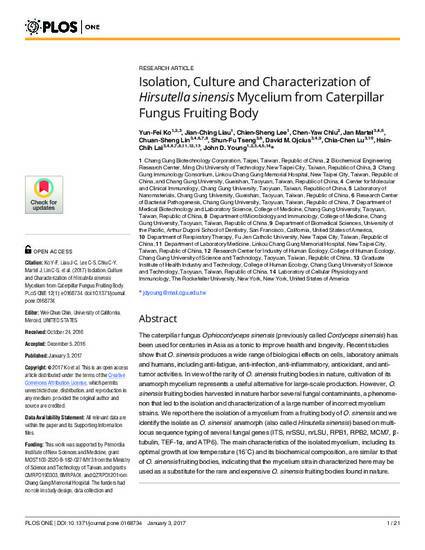 However, O. sinensis fruiting bodies harvested in nature harbor several fungal contaminants, a phenomenon that led to the isolation and characterization of a large number of incorrect mycelium strains. We report here the isolation of a mycelium from a fruiting body of O. sinensis and we identify the isolate as O. sinensis’ anamorph (also called Hirsutella sinensis) based on multi-locus sequence typing of several fungal genes (ITS, nrSSU, nrLSU, RPB1, RPB2, MCM7, β-tubulin, TEF-1α, and ATP6). The main characteristics of the isolated mycelium, including its optimal growth at low temperature (16°C) and its biochemical composition, are similar to that of O. sinensis fruiting bodies, indicating that the mycelium strain characterized here may be used as a substitute for the rare and expensive O. sinensis fruiting bodies found in nature.